Everything in the world goes through wear and tear, which leads to its damage over a period of time. Repairing this damage is highly necessary. 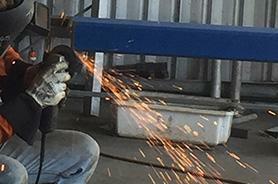 All welds require monitoring and repairs on a periodic basis, and to satisfy this need, we offer excellent welding or cutting repair, maintenance & all types of engineering services in Melbourne. We can undertake repair work for all types of welding and welds. Whether the product was originally fabricated by us or not, we make sure that the task is completed by keeping the aesthetic value intact. We check the fabrication design implemented and prepare plan accordingly. Metals such as iron or steel can continue to deteriorate once begun, and so we conduct a thorough analysis, to suggest the remedial measures for the damage which may occur in future. From an individual’s home or office to the large industrial complex, and from the structure located down the street to the pipelines and tanks fixed in the petrochemical firm, our proficient team can manage all with its tailor-made solutions. Please do not hesitate to call us for any technical help or a free quote.